SGT Sherri Gallagher of the U.S. Army Marksmanship Unit had a spectacularly successful 2010. First she won the National High Power Championship convincingly, setting records in the process. Then young Sherri earned the title of “Soldier of the Year”. Sherri is the first women ever to be honored as the U.S. Army’s Soldier of the Year. When we learned Sherri was staffing the USAMU booth at SHOT Show, we headed straight there with the hopes of chatting with America’s premier lady rifle shooter. Our correspondent Kelly Bachand was eager to talk to Sherri, as they are friends who once shot together on the U.S. National Junior team. You should really take the time to watch this video. Sherri is very open and candid about her shooting accomplishments, and she offers advice that will help any shooter. 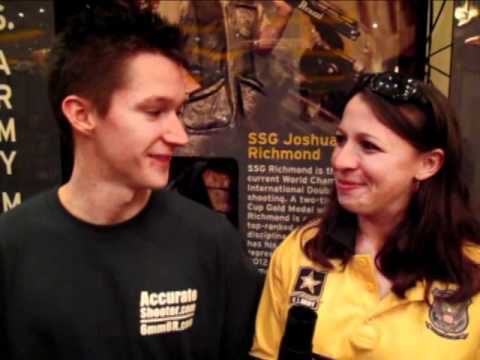 Share the post "SHOT Show Exclusive: Interview with Sherri Gallagher"
I hadn’t thought of it before, but it is CLEARLY an unfair advantage for members of the Marksmanship unit to compete against others who do not have an entire TEAM of highly trained and paid munitions experts loading their ammo and tuning their rifles FOR THEM. The NRA rules must be very loose when it comes to off-the-firing-line support. Plus, I would suspect, all funding for the USAMU is provided by the tax payer. Do other competitors enjoy the same type of support, including funding, from any of the National Rifle Manufacturers and their stable of ballisticians, gunsmiths, scientists and engineers? Is there anyone or company keeping the scales balanced? With all due respect, the point made in the two previous posts is difficult to understand. The AMU has had enormous positive influence on the HP shooting community over the years. The lessons learned by its shooters in competitions are then given back to military units under the AMU’s training mission. The AMU also participates extensively in other training for civilians, including the SAFS at Camp Perry. What would Mr. Jett and Mr. Bosco suggest as an alternative? Bar AMU shooters from competitions? Prohibit the AMU from having ballisticians, gunsmiths, etc? I am thankful for the AMU’s participation in and contributions to the sport, and I and encourage more of the same. Reminder: SGT Gallagher and her colleagues will be in Afghanistan for the next few months training our soldiers while we are at home practicing to our hearts’ content. And yes, you can be sure (and not just suspect) that the AMU is funded under the Defense Dept. budget. And justifiably so. I look forward to competing with the AMU shooters in August and am envious, not jealous, of their support team. The USAMU actively recruits from the civilian shooting community. Step up, submit a resume. SGT Gallagher has earned every accolade she has garnered. These comments regarding the USAMU were surprising and disappointing and not representative of the users of this website. SGT Gallagher was being the genuinely humble and gracious shooter that she truly is and giving credit to the people who make her job easier. She shot ever single round and earned every single point. I did not intend to rant and only signed in, in good humor, to point out that SGT Gallagher is not ” America’s premier lady rifle shooter”, but more accurately “America’s premier rifle shooter” and we could not pick a better ambassador for our sport. The fact that she is a Non-Commissioned Officer in the US Army and member of the Army Marksmanship Unit gives her access to an even larger audience and the opportunity to represent us all in the kind of professional and positive light that we can sorely use right now. Thank you for your support, Randy and Tim. SGT Gallagher works for me, and I couldn’t provide you of a better example of a well-grounded, good young NCO. Between all her Army duties and training responsibilities, SGT Gallagher fired 2 matches, I think before Nationals. She used the first team match to zero her rifle! That is pure talent, and that point is lost on people like the first two posters. It’s a childish attitude, frankly. The utility the AMU provides to the DOD (I say DOD because in my time here I have been worked with USMC, Navy SpecWar, Air Force, Guard and Reserves) is quite substantial. We have been instrumental in providing the force with SDM rifles, 77 grain Mk. 262 ammuntion, the M24 and upgraded M24E1, .338 Lapua development, and many more. Where do you think that research is conducted? Most of it is in competition. Innovations that our gunsmiths and ballisticians develop are passed directly to the warfighter. I think enough information has been presented here to credibly make the point. Mr. Sikes, Thank you for the support of our military. As a 26 year military veteran, I applaud and fully appreciate and support the official mission of the USAMU and the training that they provide to their comrades in arms as well as the overall benefit to our nation as a whole. Intraservice and Interservice competition is one thing many service members participate in. I’ve done that. However, bringing the assets of the DOD to bear against individual citizens is not quite the military’s role and does nothing to level a playing field even if temper by the envy of one individual. Having served as a military logistician and as a comptroller I know that those assets are formidable. One alternative, perhaps there will be others, would be to: Allow AMU members to compete as unaffiliated individuals. Let them take leave, make arrangements and pay for travel, subsistence, and lodging, prepare ammunition, and service and fine tune personal rifles. Give them the privilege to compete as if they were as distinct as their civilian counterparts. Allow them to bring their earned and learned skills to the line as an individual, not as a team squared off against individuals. I offer all these comments as food for thought. Mr. Praslick, No one is calling into question the prowess, integrity, and honor of any individual AMU member. They’re all to be congratulated on their skills, and the way in which they serve their brethren and the nation. This discussion is only about competitive arrangement or structure. In open competitions, the ones I’m familiar with, individuals compete against individuals. To do anything different is to reduce the competition to a lopsided affair. Teams versus individuals; this is the center of the discussion. To think otherwise, is to have missed the gist of Mr. Jett’s initial thoughts and comment. are you a current competitor in any shooting discipline? Respectfully, I disagree again, Mr. Bosco. This is not “… bringing the assets of the DOD to bear against individual citizens …”. To the contrary, bringing the AMU (and the other service teams) en masse to the National Matches provides immense benefit to the competitive shooting community. We “Individual citizens” have the incredible opportunity to meet and compete with their talented and superbly trained shooters. To do this at the National Matches is like a weekend golfer being allowed to compete head-to-head with Tiger Woods and Arnold Palmer at the Masters golf tournament. If you could play with Tiger and Arnold at the Masters, would you complain that they have the advantage of private coaches and manufacturer-provided equipment, transportation and so on? Or would you appreciate the golden opportunity to play with them and to benefit from the experience? Competitive shooting is not about winning medals and trophies. It’s about the discipiine – the focus, the perseverance, the learning process, the constant drive to improve. We competitive shooters relish the challenge. This is greatly enhanced by the presence of the USAMU and the other service teams. Competitive shooters don’t whine about the other guy. We just train hard and do our best. While scoring for, shooting with and working in the pits with the AMU’s SSG Brandon Green, he was patient and gracious enough to answer my questions, teaching others and me some finer points about wind reading, trigger control and other topics. I have had similar experiences with other AMU, Navy and Marine shooters, as well. Hundreds of shooters have had the privilege of being taught by members of the Army and Marine Marksmanship units at the SAFS and other clinics during the National Matches – that would not happen under the “unaffiliated individual” scenario you described. The presence of the AMU team allows this to happen. Not to mention the USAMU armorers’ support in checking rifles, weighing triggers, providing on-the-spot assistance on the firing line … Their contributions are extensive. You might also check out some of the other educational opportunities provided by the AMU shooters and coaches on the CMP web site (check under “Coaching Resources” – “Tips from the USAMU…”). I join with most of the competitive highpower shooting community in thanking the USAMU for its participation in and support for civilian matches over the years. We will all be very fortunate if we see the USAMU team (shooters, coaches, armorers, support staff) at our matches for many years to come. Bring ‘em on. Please! Well, it may be better for the competitors she is shooting for the AMU. When SGT Gallagher was a full time member of Team Tompkins she was kicking our butts regularly. It is enjoyable to compete with the AMU members. The few I have competed with in smallbore and highpower are class individuals. Military participation in competitive shooting sports dates back to the start of the NRA and long range shooting in the 1870’s. Competitive shooting is at a great time in history. Just about anyone can purchase a quality, competitive rifle and produce reloaded ammunition that can compete with the best. It is the desire, dedication and mental toughness that separate the competitors. High power rifle shooting doesn’t require exceptional athletic ability to compete at the highest levels. Just gaze down the firing line. The equipment can be bought the intangibles have to be earned. Enjoy the AMU’s presence and mission. The Marines, Navy, Coast Guard and Air Force have really limited their support and involvement in the shooting sports as of late.